I looked at the financial practicality of buying solar panels for my home a while ago. At the time I concluded that the cost was just too high to warrant it given the returns. 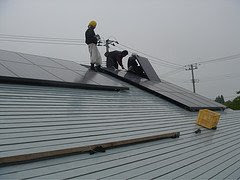 Since then however the federal government has improved the tax credit you can get for solar panels. Originally the tax credit was 30% of the cost with a maximum of $2000. But as part of the Emergency Economic Stabilization Act of 2008 they got rid of that $2000 cap on the tax credit. That makes solar panels much more economical. Before for a 2kW installation the cost could be about $15000 and the tax credit would be capped at $2000 but now the tax credit will be a full 30% or $4500. Keep in mind these are just estimates and they are specific to my region. The incentives very from state to state and utility to utility. Also the amount of electricity you save will be dependent on how much sun you get in your region. Your numbers are going to be different. How does buying a solar panel compare to other investments? If I look at the 2kW system with a purchase cost of $2,000 and put the annual energy savings of $192 in the bank and compare that to putting the $2,000 in CDs / savings at 3-4% then I'd be ahead in about 10-13 years with the solar panels. If I could instead safely make 6% on my money then the payback would be around 12-16 years. Looking at it another way if you bought a solar panel system today for $2000 and put your resulting annual energy savings into a bank account earning 3-4% you would have about $7,400 after 25 years. By comparison if you just took that $2000 and put it in the bank you'd have $4,188 in 25 years. In 25 years I'd be ahead over $3,200 if I buy a 2kW solar system. What if I sold the house early? Say I went and put a 2kW solar panel on the house and then expected to break even in 10 years but we had to move for unforeseen reasons in 2 years. Would I get the money back? Remember that while my personal out of pocket cost is $2,000 but I'm getting a solar system worth $15,900. I found this source that claims that you get back $20 in home value for every $1 you save in electricity on a solar system. So my $192 annual savings should equate to $3,840 in home value. I think its a safe bet that if I had to sell the home then I'd get back at least the $2,000 out of pocket. Given the current tax incentives I think that solar panels can be a good buy and are definitely worth a strong look. Should we all run out and buy solar panels? Well no. Instead I'd first look at other ways to cut your energy costs and do the items with the best bang for the buck first. I'm pretty sure I can get more bang for my buck by putting some money into weather sealing and extra insulation so I should pursue those first before putting $2,000 into solar panels. And the actual incentives you can get for buying solar panels and the energy savings you get from them will vary a lot from location to location.